Sterling Drilling Company was founded in 1943 in Sterling, Kansas. Sterling Drilling Company is one of the oldest established drilling contractors in the state of Kansas. 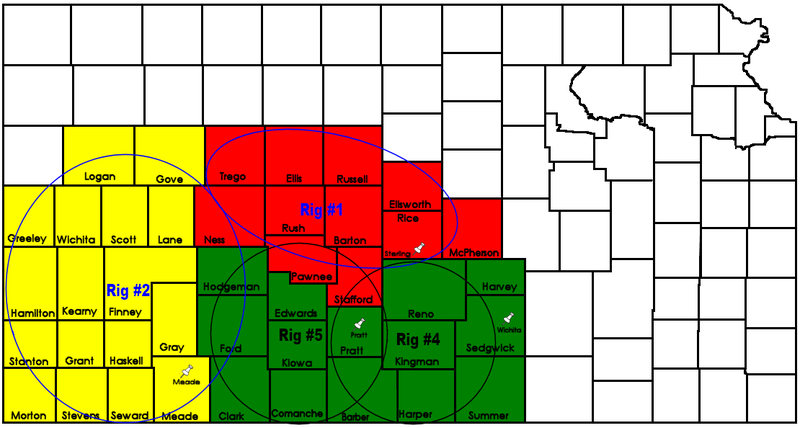 Sterling is also one of the most respected drilling contractors in the state of Kansas. The company operates in 42 Kansas Counties. Based in Pratt, KS, Sterling Drilling Co. has experienced crews throughout the central, south-central and western Kansas areas. From oil and gas well drilling, to brine and cavern well drilling, to deep large diameter disposal well drilling, Sterling is the contractor you can count on and trust. Sterling has completed many projects including, directional natural gas storage field projects, brine well gallery (horizontal) work and KDHE governed deep large diameter disposal projects. Our small compact knowledgeable office group can help you complete your projects and obtain your Kansas drilling goals.